Muscles connecting the upper extremity to the vertebral column (posterior view). Infraspinatus muscle (shown in red) seen from behind. It attaches medially to the infraspinous fossa of the scapula and laterally to the middle facet of the greater tubercle of the humerus. The fibers converge to a tendon, which glides over the lateral border of the spine of the scapula and passing across the posterior part of the capsule of the shoulder-joint, is inserted into the middle impression on the greater tubercle of the humerus. The trapezoidal insertion of the infraspinatus onto the humerus is much larger than the equivalent insertion of the supraspinatus, the reason why the infraspinatus is involved in rotator cuff tears about as frequently as the supraspinatus. The suprascapular nerve innervates the supraspinatus and infraspinatus muscles. These muscles function to abduct and laterally rotate the arm, respectively. The infraspinatus is frequently fused with the teres minor. 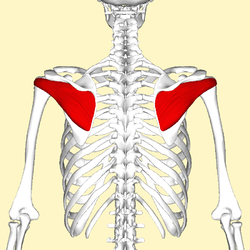 The infraspinatus is the main external rotator of the shoulder. When the arm is fixed, it abducts the inferior angle of the scapula. Its synergists are teres minor and the deltoid. The infraspinatus and teres minor rotate the head of the humerus outward (external, or lateral, rotation); they also assist in carrying the arm backward. From an evolutionary prospective, the pectoral muscles – the pectoralis major and pectoralis minor – are thought to have evolved from a primitive muscle sheet that connected the coracoid to the humerus. In late reptilians and early mammals, this muscle structure was displaced dorsally; while most of its components evolved into the pectoralis major, some fibers eventually attached to the scapula and evolved into the supraspinatus, the infraspinatus, and parts of the subscapularis. Infraspinatus muscle (shown in red). Animation. Muscles on the dorsum of the scapula, infraspinatus is labelled 8 (posterior view). ^ a b c d e Gray's Anatomy, see infobox. ^ Mochizuki, T.; Sugaya, H.; Uomizu, M.; Maeda, K.; Matsuki, K.; Sekiya, I.; Muneta, T.; Akita, K. (2008). "Humeral Insertion of the Supraspinatus and Infraspinatus. New Anatomical Findings Regarding the Footprint of the Rotator Cuff". The Journal of Bone and Joint Surgery. 90 (5): 962–9. doi:10.2106/JBJS.G.00427. PMID 18451386. ^ a b Platzer, Werner (2004). Color Atlas of Human Anatomy, Vol. 1: Locomotor System (5th ed.). Thieme. p. 138. ISBN 3-13-533305-1. Saladin, Kenneth. Anatomy and Physiology: the Unity of Form and Function. 7th ed., McGraw Hill Education, 2014. pp. 343, 346, 491, 543. Funk, Lennard. Rotator Cuff Biomechanics. Shoulderdoc.co.uk. TheFresh Healthcare Marketing, 11 Feb 2016. Web. Wikimedia Commons has media related to Infraspinatus muscles.